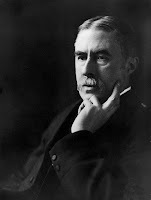 In my previous post, I talked about the poet AE Housman's unrequited passion for his friend from university days, Moses Jackson and how this single relationship seems to have coloured Housman's emotional life. His later poems feature in my song cycle Four Songs to Texts by AE Housman and in my song When Summer's end is nighing. Baritone Johnny Herford and pianist William Vann perform both works on the new disc of my songs, Quickening , for which we are currently crowd-funding. When reading some of these later poems it is difficult not to read auto-biographical elements into the poems, and this is particularly true of the ones published by Laurence Housman after AE Housman's death. Whilst 'A.J.J – When he's returned' is clearly referencing the death of Moses Jackson's younger brother Adalbert (who died in 1896 and with whom Moses and AE Housman shared accommodation for a period), the dignified restraint of the poem allows for a welter of other connections to be made. That grace, that manhood gone. That long ago lay down. He would not stay for me, and who can wonder? Whilst in 'Because I liked you better' you get a clear picture of the stiff relationship between AE Housman and Moses Jackson, a far cry from the lyrical imagining. This was a poem that AE Housman never published, though Laurence seems to have been happy to after AE's death. `I will, no fear', said I. All the above poems feature in my Four Songs to Texts by AE Housman, but the final Housman song takes a poem from Housman's final publication, Last Poems of 1922. This is one of lyrical regret for a life lived, one who has grown old and whose comrades have not returned. It is classic Housman, in Virginia Woolf's tart summary of the poet's work 'May, death, lads, Shropshire'. Must now be worse, worse and few.